The color was a bit orange-y for me. Then again, I don't use lip pencils and it wasn't going on my eye since it was orange-y. I'm sad I didn't get the color in the photo. I've been using the oil. I'm not actually sure what it's supposed to do, but I did read something about my hair drying faster, which I haven't really experienced. Luckily, these sample sizes are big enough to use these for several applications so I've been using the oil for a week. My hair isn't super oily after using it, so no complaints from me! I liked the stick perfume. Unfortunately, I'm a creature of habit and wear only 2 different perfumes. Clinique Happy and Vera Wang Princess. This stick did smell good and maybe I'll try wearing it soon. I didn't try this on my face because my face has been extremely ..."moody" lately. I'm afraid to try new things other than the Mary Kay stuff (that I paid wayyy too much for and isn't working, surprise) to piss my skin off more than it already is. Le sigh. PS. I still love the boxes that the samples come in. I might have actually reused at least one of the boxes to wrap Cmas presents in. Along with this box, I also got a "coupon." 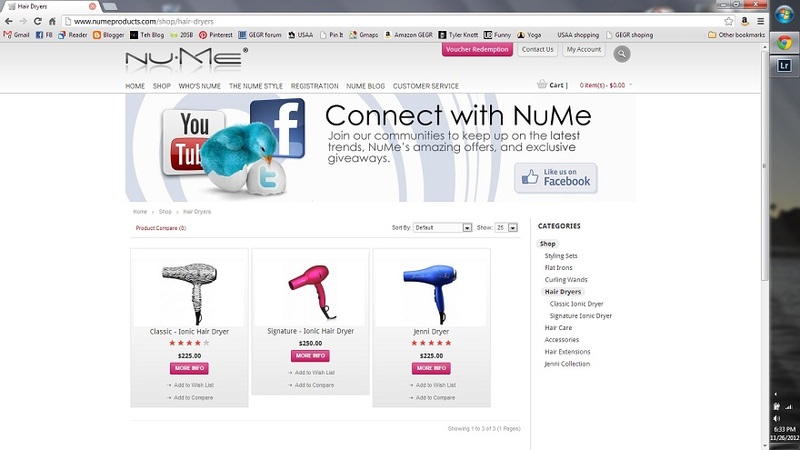 1 was for $100 off a NuMe styling tool or hair extension. I'm a reasonable individual, so I was thinking, SWEET FREE CRAP! Apparently... NOT. If anyone would like this coupon it expires Dec 31, 2012. Can someone please tell me the difference between this $200+ hair dryer and the $15 hair dryer at Wal-Mart? 1. I used MK, liked it, but couldn't justify the price. Lately I just buy Clean & Clear from Walmart. My biggest problem is actually doing int consistently...every night...I'm lazy when I'm tired, ok? 2. I refuse to buy expensive straighteners anymore. People claim the Chi, etc, is AMAZING but my stuff never lasts. I had someone GIVE me one that cost over $100 and it just quit working in less than 6 months. Apparently I am just way too rough to have nice things.